Home | Finances and payments| Accruals and Payments payments section contains all the information related to financial aspects of cooperation with the publisher. Here you can check the balance of the internal account иand track the daily accruals on Finances and payments | History of Operations. Finances and payments | Exchange Rates tab is for information only, it contains the rate of exchange used for the settlements in the system. Here you can also find the agency accounts, that can be used for working with external ad systems. First, the publisher publishes links on his/her sources. So far there’s nothing in the Statistics. Visitors haven’t noticed the ads and thus haven’t clicked on them so far. How to trace the commission in the interface. Statistics is live now, so visitors view the adverts and perform some actions. So, on this stage the publisher has got the traffic related to the offer. But so far there are no approved lead or target, only open leads and targets. That’s because technically we can present the information on leads or targets in the real time, but these figures have not been verified so far. I.e. those open leads have not been approved by the advertiser. Some advertisers submit this data with delays. See detailed information on conversions upload. Approval time. The advertiser checks the leads an targets, the achievements and their quality. Poor-quality leads are rather widespread: incomplete applications, or applications with jumbled text. Some actions can also be rejected by the advertiser: e.g. the customer canceled the delivery and did not buy the ordered goods. Not all open leads will become approved leads. Open leads form the amount of the potential earning, not the guaranteed earning. Payment time. The advertiser provides the information on approved and rejected targets. After the inspection by the advertiser open leads will become approved (or rejected, if the lead was not approved for some reason). Only after the above process is completed, we start the settlements with the advertiser. Now the advertiser pays money for all the approved targets, and the earned money will be transferred to the internal account of the publisher. System hold time. After receiving data from the advertiser we start the active processing of it. We check the traffic for fraud, and this is the task that we are rigorous about. See more details on payments and external accounts. And then the scheduled payment date comes. After all the waiting and suffering the publisher receives the payment. Payments are made according to the schedule, and the funds are transferred to the main external account specified by the publisher. Remember that changing the currency of the internal account is a charged operation. The commission is 3%. 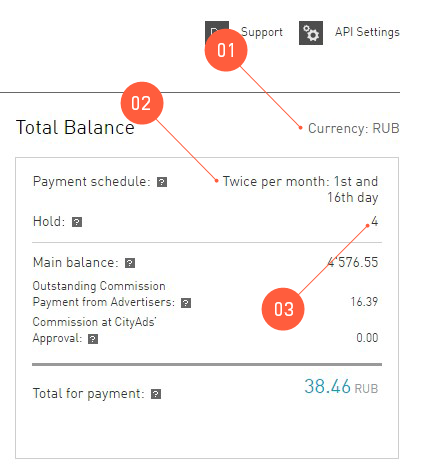 After registration in the system each publisher will receive the internal account containing all the information on the cash flow of the publisher in the system. Earned money are deposited to the internal account and then paid to the external accounts. EUR — euro, official currency of the eurozone. Payment schedule. Transfer of money to the external account basically means payment of the publisher’s earning to the personal account of the publisher. It happens twice per month, on the 1st and 16th day of the month, no lunch time or days off. We call it the payment schedule. By agreeing to work with us, the publisher agrees to that schedule too. System Hold time is the individual setting reflecting the time of delay with transferring the money. The system checks the traffic. In the section Office | Payments | Accruals and Payments you can find all the information about the financial state of the account. Transaction details. The chart shows the accrual structure by offers. Total balance. The Total Balance table displays the information about the publisher’s balance. ** All account transactions**. The table contains information about payments to the publisher’s internal accounts. If the hold time is beyond reasonable (i.e. 14,999 days), the payment is probably under revision and is frozen for the duration. Don’t panic: if your traffic is clean, you can easily resolve the issue with tech support . Have an External account to transfer the money to. Earn more than the minimum withdrawal amount. Not be banned. This means providing clean honest traffic that our QA experts won’t find suspicious. When creating a first external account, a mobile phone number must be entered. This number will later be used for verification of payment operations via SMS (for example, creating an additional payment account). Please note that the number for verification may be different from the contact number entered, and not show up in the Home | My Account | Account section. This change can only be made in the future by contacting technical support . By agreeing to work with us, publisher accepts, among other things, the condition of minimum withdrawal. Minimum withdrawal amount is the minimum amount we will transfer to external accounts. 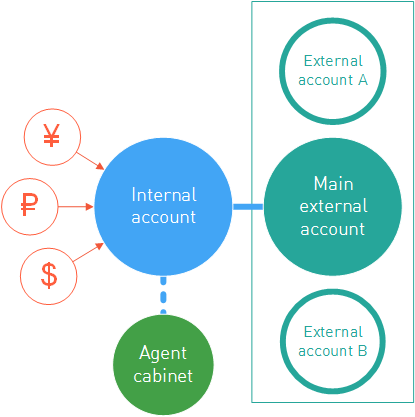 If there is not enough money on the internal account to transfer, the funds will remain on the internal account. All payments made through our system go through several stages before reaching your external account. These stages are called Statuses, and each payment in Office | Finance and payments | Accruals and payments | All account transactions table has one. New. This represents that we have just recently created the withdrawal application and prepared the funds. On Payment. This means that the transfer process for this application is under way, but the recipient system did not confirm the transfer just yet. Sadly, there are times when the recipient system will decline the transfer, due to various reasons. Should this be the case, the relevant operation in Office | Finance and payments | Accruals and payments | All account transactions table will be marked as Cancelled, and the funds will be returned to your internal account. Don’t panic and contact tech support . Our experts will help you figure out the problem and quickly solve it. Invoice must be provided for each regular payment. PayPal or bank transfers are more complicated, as they require the publisher to provide invoices for the payment to come through. First status is New: the transfer application is created within the system. If the documents were not uploaded within 10 days, the status will automatically change to Declined. Next, the application status will change to Document required. 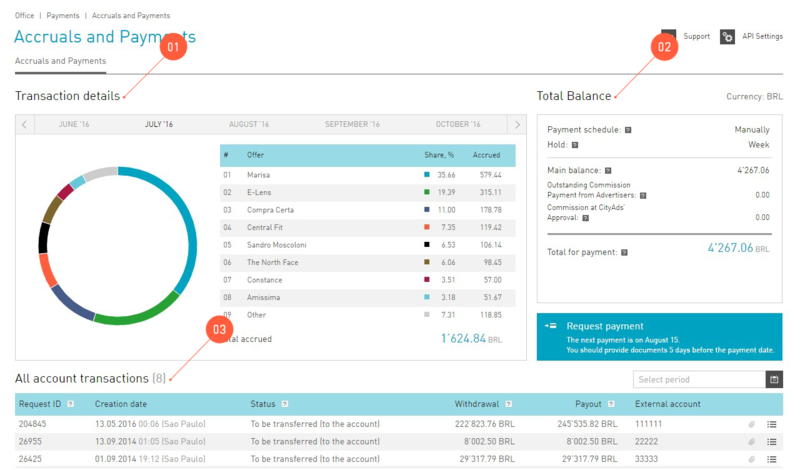 A new button will be enabled in the All account transactions table: . It is used to upload documents. This status requires actions from the publisher and expires in 10 days. As soon as the invoices are provided, the status will change to Document check. This means that the documents are being reviewed by our managers. After all required documents are provided, the funds will be transfered to your external account within 3 business days. The application status may change back to Document required if the documents provided are insufficient. You can find out what was missing or incorrect in your documents by checking the comment to the status. After the documents are verified, application status will change to On Payment, and later to Paid. This status shows that the process is complete, the money is on your external account, and everything went according to plan. All the information about publisher’s external accounts added to the system by himself/herself is available under Office | My Account | Payment Information. is an account to which money is withdrawn from the system. External accounts are essentially records about publisher’s e-wallets and bank accounts. We can make payments only when we know to which wallet or account the publisher expects to receive them. Furthermore, in our system a publisher can create not only a primary account for payments but a number of ‘reserved’ accounts as well. We call them Additional accounts. is a record about a publisher’s external account that is stored in the system but is not involved in the regular payment process. A publisher can register an Additional external account under Office | My Account | Payment Information by setting its Status to Additional. Only one external account can be main in the system. As the payment date comes, we transfer the money earned by the publisher to external accounts. One account can have several external accounts attached, but the planned payment will be transferred only to the account that you mark as Main. You can add an external account in the section Office | My Account | Payment Information. Go to the section and click Create an account. Account’s name. Give the account a name that is clear and convenient for you. Choose the :guilabel:`Main`account status, if you want planned payments to be transferred to this account. Destination country is the country where your account is registered. Choose the Recipient’s status: Legal entity, Private entrepreneur, Individual. PayPal. In the current release Paypal payments are not supported. Choose the currency of your external account. This currency will be used in money transfers to your external account. Fill the Account details carefully so that the money won’t get lost on the way. Then the system will ask you to confirm the creation of an external account via an SMS message.